This year, we are excited to present “Kodo One Earth Tour: Evolution” in North America for the first time. Here are some fun facts to read about this dynamic production before you head to the theater. 1. 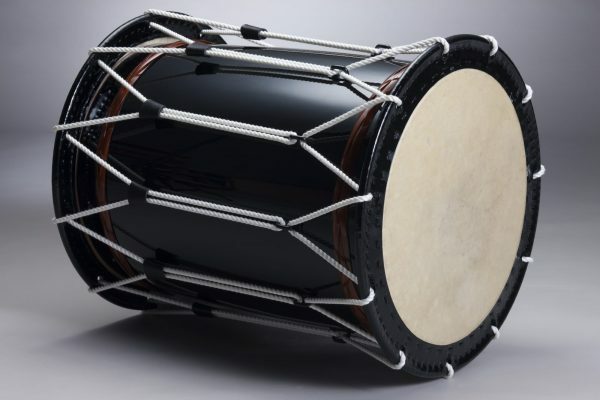 Ayaori is played on newly-designed drums that produce a different key on either side. Ayaori means “twill weave.” This composition is performed by three drummers playing katsugi okedo daiko (portable barrel drums). At first glance, these three drums look like regular barrel drums, but there’s more to them than meets the eye. 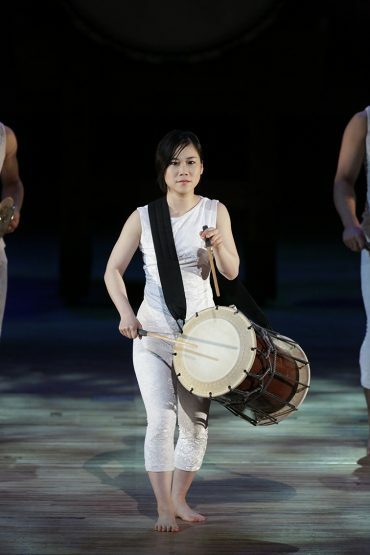 This innovative taiko, Kanade, was developed by Kodo performer Masayuki Sakamoto in collaboration with renowned Japanese taiko maker, Asano Taiko. Recipient of the Japan Good Design Award in 2015, it’s the world’s first taiko that lets a performer tune the drumhead on either side to a different key. 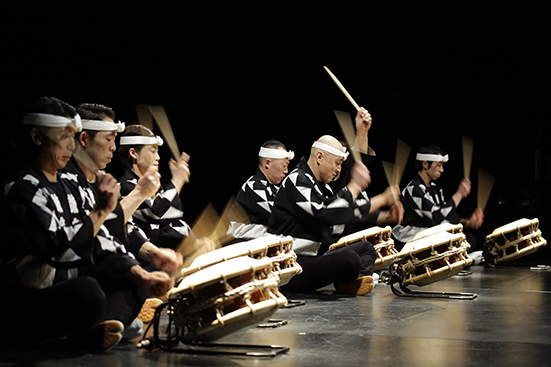 In Ayaori, the drummers use the two-tones of the drum and a range of different drumsticks to weave a multitude of tones into a musical tapestry. 2. The performers use handheld switches to control their overhead lights in Ake no Myojo. Set in a realm of darkness, captivating Ake no Myojo is a dynamic yet haunting piece. Its name means “Venus in the morning sky.” Each performer appears wearing a light overhead that they control using a handheld switch to create two light patterns. This complex piece challenges the performers to drum, sing, and dance in rapidly-changing formations, all while carefully controlling their individual overhead light. 3. The climatic finale, Rasen, has a special significance to the production. “Evolution” showcases Kodo’s classic and latest repertoire and its climax is the finale, Rasen, which means “spiral.” In fact, this production premiered in Japan as “Kodo One Earth Tour: Spiral” to match the Japanese production name, “Rasen.” In the eponymous final number, the performers conjure a spiral as they perform in turn, creating a whirling vortex of energy that envelops the entire audience. Rasen also depicts a helix of sound and spirit that connects Kodo’s history to its present and continually drives the ensemble headstrong into the future. 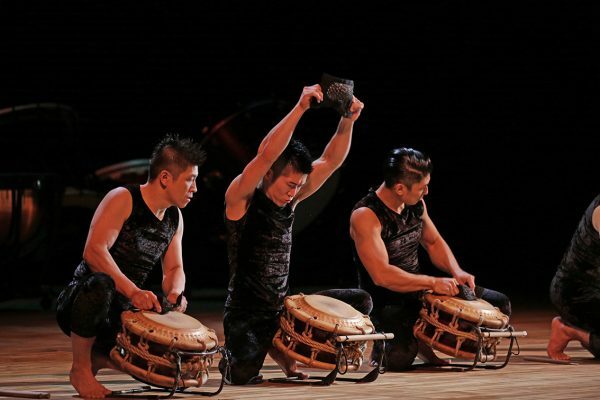 Refrains from long-upheld Kodo signature pieces emerge within the fervent torrent of beats as the next generation pays homage to the past while asserting their own dedication to the evolution of taiko performing arts. 4. The performers use custom-made bags of bells instead of drumsticks in Color. This comical piece offers some lighthearted relief by playing taiko that usually appear in very traditionally performing arts, such as Kabuki and Noh theater, in brand new ways. The concept behind Color is a fun piece where the drummers and drums creates a rainbow of sound. One of the most unique ways the drums are played in Color is by beating them with a bag of little bells. Just picking up one of these bags makes a sound, but when you hit the taiko with it, you get two sounds at once. 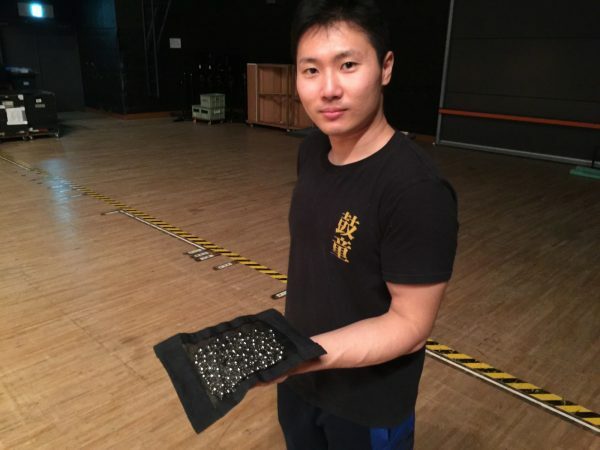 Kodo discovered that if the performers made their own bag of bells, this type of “drumstick” broke very easily, so now a professional craftsperson makes the sturdy bell bags for Kodo, especially for that particular purpose. Monochrome is the final number in the first act of Evolution. This intricate taiko piece was created by modern composer Maki Ishii and Kodo has performed it for decades on countless stages around the world. In 1976, the premiere of Monochrome was performed by Kodo’s antecedent group, Sado no Kuni Ondekoza, and the ensemble has continued to uphold this piece ever since. It remains one of the most iconic pieces in Kodo’s broad repertoire. This up-tempo piece was composed in 2012 by Kodo performer Yuta Sumiyoshi, who has a special flair for creating sound. He penned Kei Kei to fulfill a request for a “youthful, shiny, happy tune.” Then Tamasaburo Bando, the director of the production that first featured this piece, had the idea to arrange it as a medium-tempo, jazz-like number, played by many performers moving around in a circle. That’s how the current performance style of this piece emerged. 7. The taiko used in Kusawake are original instruments designed by Kodo. Kodo is not only dexterous when it comes to playing traditional Japanese instruments; the ensemble also develops new instruments to use on stage. One example is the shime-jishi daiko used in Kusawake. 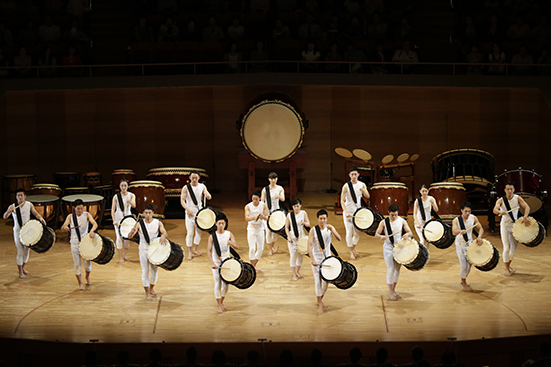 When taiko are played as an ensemble, the drums can tend to drown each other out. So Kodo created a new drum with a shrill, sharp sound that enables it to stand out and be heard. 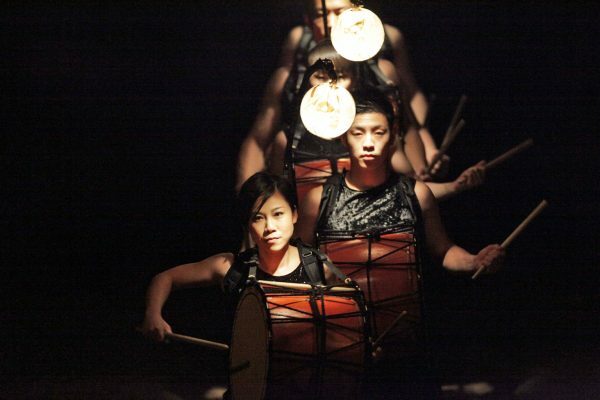 The inventive shime-jishi daiko uses different skins for either head and can be played with bamboo or wooden sticks to elicit a range of tones. 8. 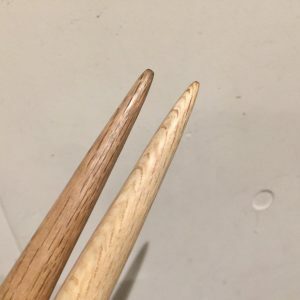 The drumsticks used to play Monochrome have an unusual shape. Since ancient times, the loud, resonant sound of taiko has been used in an array of ways, such as to convey prayers, deliver messages, and signal battles. However, Maki Ishii’s Monochrome begins with barely-audible beats, which is one of the reasons this work is considered a revolutionary, modern composition. 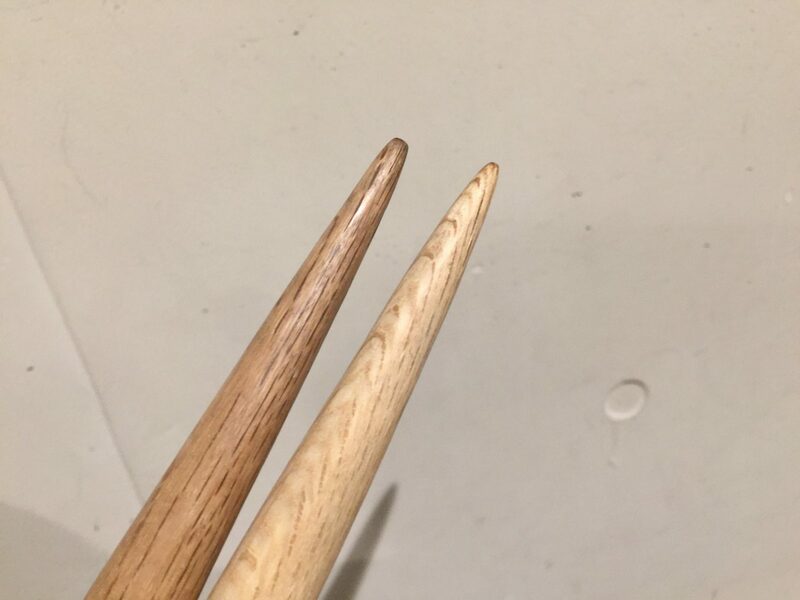 To produce such a faint sound with taiko, the Kodo performers make drumsticks with finely tapered tips, especially for this piece. 9. The bamboo flutes used in Yuyami are selected for the key of the piece. 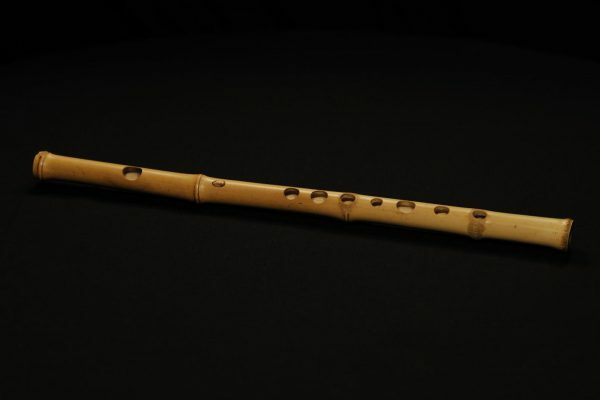 There are a range of traditional flutes in Japan, such as the nohkan, used for Noh theater, and the ryuteki and hichiriki used in court music. Yuyami, which means dusk, features the shinobue, a traditional Japanese transverse flute made from small bamboo. There are two types of shinobue: one is the “classical” type, used for traditional performing arts, and one is the “song” type, which is made to suit the Western scale. There are several different flutes for each type because each shinobue is used to play a different key. Shinobue are numbered so performers know which flute is in which key, allowing them to select the right flute for a particular song. So, while all shinobue may look the same, sometimes you will see performers change their flute during a shinobue piece to play a part in a different key. 10. 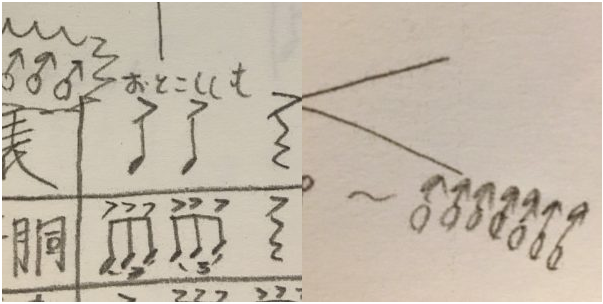 O-daiko soloist Kenta Nakagome has his own original style of music notation. 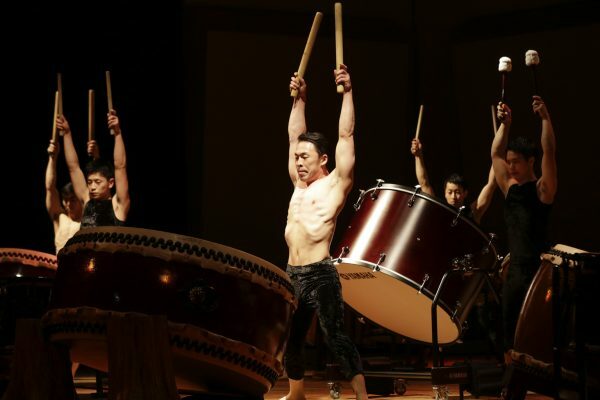 Kenta Nakagome is one of Kodo’s power hitters and audiences will get to see him in action in “Evolution” playing the big drum, O-daiko. 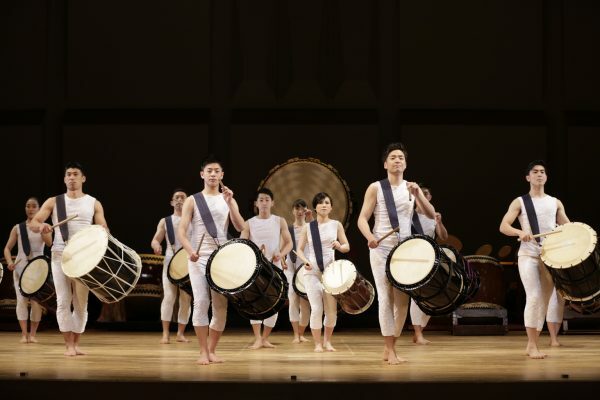 There are two common ways for taiko players to learn or share a composition: one is by speaking the rhythms and the other is by using written scores, such as those commonly found in Western music or classical Japanese music. A fun fact about Nakagome is that he uses his own style of music notation to convey the sound he has in mind to his colleagues. So, do you have any idea what these symbols might mean? Perhaps you’ll find out when you see him in action on stage! Here’s a sneak peak. We hope to see you at a theater near you soon!